Which "Parks and Recreation" Couple Is Your Relationship More Like? Which “Parks and Recreation” Couple Is Your Relationship More Like? 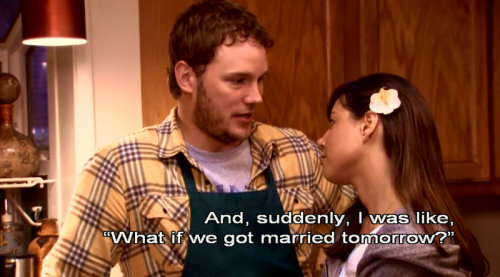 Parks and Recreation does a great job of portraying realistic, supportive relationships. The duos at the core of the heart-warming sitcom are government power couple Leslie and Ben, and eccentric slackers April and Andy. These couples are radically different but equally adorable. Which pair best resembles your relationship with your significant other? Here’s how to tell which couple is your Parks and Rec equivalent. When you two first met, you didn’t get along. But then you started to like each other. You both get really excited about things. You are both pretty nerdy. You are willing to make sacrifices for each other. You take risks together, because you know you can make it through anything. You like to make big declarations of love. One of you is super outgoing. While the other is anti-social. You love each other, but you’re casual about it. Your relationship moved very quickly. Both of you are still figuring your lives out. You two don’t conform to relationship norms. Above all, you just want to have fun together. Both couples are loving and always there for each other. So whichever one you and your partner are more like, you probably have an awesome relationship.